Dr. Mehta is an Associate Professor of Radiology, and Dr. Thomas is a Radiology Fellow, at the University Hospitals of Cleveland, Case Western Reserve University, Cleveland, OH. Dementia is an acquired, progressive, global impairment of intellectual functioning involving memory, language, thinking, and perception. This disorder can be caused by more than 80 diseases, a few of which can be reversible. Dementia can present a diagnostic challenge to clinicians as there can be much overlap between the various causes (Table 1). In addition, several of the diseases share common histopathologic and clinical features, and rather than reflecting discrete entities, are felt to be part of a spectrum of neurodegenerative syndromes.1,2 Currently, 35 million people worldwide are affected by dementia, with 5 million new cases added every year. In the absence of new treatment breakthroughs, 80 million cases are predicted by 2040,3 with the rising prevalence due mainly to increasing life expectancy. The clinical diagnosis of dementia is based mainly on clinical criteria, such as those delineated in the DSM-IV and DSM-TR.4 The criteria will be revised this year, but currently they consist of the development of multiple cognitive deficits, including impairments in memory andin at least one of the following: language, motor activity, recognition, and executive function. In addition, the cognitive deficits must be severe enough to interfere with social/professional function, and they must represent a decrease from baseline. A diagnosis of dementia should not be made if the cognitive deficits occur exclusively during the course of a delirium. However, dementia may be related etiologically to a general medical condition, cerebrovascular disease, persisting effects of substance abuse (including toxin exposure), infections like HIV, or multiple other etiologies. Alzheimer’s disease (AD) is usually diagnosed by excluding the above etiologies; each of these is classified as a separate category in DSM-TR. Patients undergoing a dementia work-up must have a comprehensive clinical exam that includes a medical history obtained from both the patient and a well-acquainted informant, cognitive scales or neuropsychological testing, laboratory tests, and structural imaging, such as magnetic resonance imaging (MRI) and computed tomography (CT). 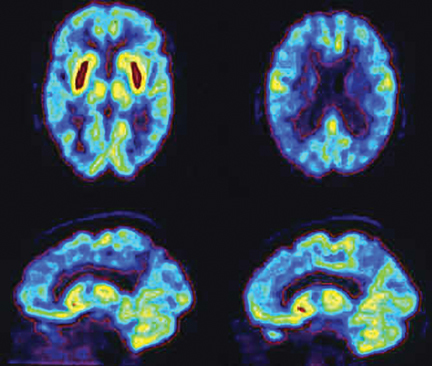 Single photon emission computed tomography (SPECT) has historically been the modality of choice for functional neuroimaging in the dementia work up, but is being replaced by positron emission tomography (PET). SPECT mainly assesses perfusion, while PET focuses primarily on metabolism, with both presenting similar diagnostic information. The advantages of PET over SPECT include better spatial resolution and the ability to quantify changes. In addition, the magnitude of hypometabolism seen with 18FDG-PET is frequently greater than that seen with SPECT.5 Common tracers for SPECT imaging include the cerebral blood flow agents 99m-Tc hexamethylpropyleneamineoxime (HM-PAO) and technetium Tc-99m bicisate. 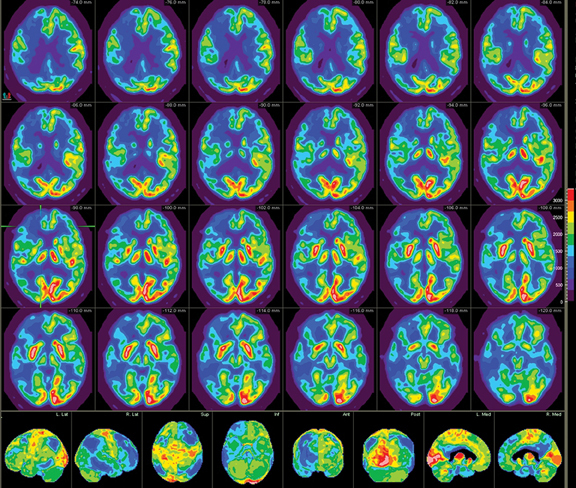 F-18 fluorodeoxyglucose (FDG) is the most commonly used agent in PET imaging. As a glucose analogue, FDG reflects cerebral glucose metabolism(Figure 1). Other PET agents are being developed to assess more specific cellular and neurotransmitter activities; several are discussed later in this article. Protocol standardization is important for consistent FDG brain-PET imaging. The brain-PET protocol in our department includes securing intravenous (IV) access 15 minutes prior to injection, which minimizes stress. In addition, to minimize activation of the visual cortex and other brain centers, patients are provided with a comfortable resting place in a stress-free, quiet, semi-dark environment during the radiopharmaceutical uptake phase. Sedation, if necessary, should be performed after radiopharmaceutical dosing. The scan itself is performed in a comfortable but standardized position with contemporaneous acquisition of low-dose CT images for attenuation correction. Postprocessed images are digitally coregistered and reconstructed in the orthogonal planes for interpretation. The software used in our department also allows for digital coregistration with MRI. AD, the most common form of dementia, was originally described in 1907 by the German psychiatrist and neuropathologist, Alois Alzheimer, who presented clinical and neuropathological features of a demented woman who died at age 51. 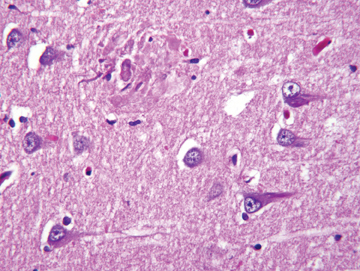 Alzheimer noted postmortem pathology findings of thinned cerebral cortex, senile plaques, and neurofibrillary tangles (Figure 2), which are still considered to be pathologic hallmarks of the disease. AD is estimated to cause approximately 70% of all dementias. The age of onset is typically between 40 and 90 years,with greater incidence in those ≥65 years of age. The prevalence of the disease rises exponentially with age, increasing from 3% in those aged50-75 years to 50% among those ≥80 years old.6 The risk factors for AD are summarized in Table 2. AD is a progressive neurodegenerative disease that results in irreversible loss of brain cells. The disease usually begins with mild memory problems and ends with severe brain damage, severe memory loss, confusion, depression, hallucinations, delusions, restlessness, sleeplessness,and loss of appetite. The most common and distinctive hallmark histologic brain lesions are senile plaques and neurofibrillary tangles (NFTs).The disease is felt to represent a spectrum that extends from mild cognitive impairment (MCI) to severe AD. In MCI, patients demonstrate decreased memory or language that is severe enough to be noticeable but not severe enough to interfere with daily life; it is seen in up to 20% ofAmericans and has 2 subtypes — nonamnesiac and amnesiac. Patients in the nonamnesiac category present with behavioral changes, including alterations in language, judgment, and attention. Patients with the amnesiac variety are often aware of memory issues and are still able to function effectively. Not all patients with MCI will progress to AD; annually, 10% to 15% of patients with amnesiac MCI will progress, while others may improve with time. PET imaging can help with early identification and interventions in those who may progress.8 Standardized primary cognitive assessments, such as the mini-mental state examination (MMSE), provide a brief, focused survey of cognitive domains most often affected in AD and allow for objective documentation of cognitive dysfunction. A meta-analysis of 15 articles published between 1989 and 2003 demonstrated a sensitivity of 86% (95% confidence interval [CI]:76%, 93%) and a specificity of 86% (95% CI: 72%, 93%) for FDG PET14 in the diagnosis of AD. However, recent studies on larger patient populations demonstrate sensitivities approaching 93% to 95% in AD12,15 (Table 3). Early and accurate AD diagnosis is important for patients to derive the maximum benefit from available pharmacologic and cognitive therapies. Although no definitive treatment orcure is available for AD at this time, different pharmacologic agents are being actively investigated; several are available to treat symptoms of the disease. Cholinesterase inhibitors like Aricept, the most widely used and only FDA-approved drug for all stages of AD, improves acetylcholine levels, which are deficient in all stages of the disease. Available data suggest that approximately 15% to 40% of AD patients treated with the drug show varying degrees of cognitive improvement. Another drug, Namenda, approved for moderate-to-severe AD, is thought to regulate glutamate, a neuroprotective agent, which can reduce oxidative stress. Early diagnosis of AD also allows for contemporaneous initiation of palliative, psychosocial, and cognitive therapies, as well as initiation of support systems. It also provides the patient adequate time to address personal, financial, and legal ramifications of the disease. DLB is the second most common cause of dementia, accounting for 15% to 20% of all cases. Fluctuating cognition, visual hallucinations, and lowered attention span often precede memory loss; this contrasts with AD, in which prominent and progressive memory loss often precedes neuropsychiatric features. Patients with DLB may also demonstrate Parkinsonian-like symptoms. The specificity for diagnosis based on clinical criteria is variable (30% to 100%); sensitivity is low (22% to 75%).19 The pattern of FDG metabolism in DLB differs fromAD; in contrast to the classic appearance of bilateral temporal-parietal reductions in FDG metabolism with AD, DLB commonly appears as globally reduced cortical metabolism, most notably in the visual association cortex of the occipital lobe (Figure 6). The reduction in occipital glucose metabolism in DLB can differentiate DLB from AD with a sensitivity of 86% to 90% and a specificity of 80% to 91%.19,20 The reason for the selective involvement of the occipital region is unclear and has been attributed to the degeneration of dopaminergic neurons or cholinergic neurons from the basal nucleus of Meynert; imaging with dopaminergic ligands has been suggested to increase specificity for diagnosis of the disease. In addition, the relative preservation of the mid- or posterior-cingulate gyrus metabolism (cingulate island sign) may enhance PET specificity in differentiating DLB from AD. A neurological movement disorder originally described in 1817 by James Parkinson, Parkinson’s disease (PD) is characterized by the deterioration of neurons in the substantia nigra, resulting in decreased dopamine levels. Cognitive deficits appear in the late stage of the disease in about 41% of the patients with PD; these may range from isolated cognitive impairment to severe dementia. Imaging features of the disease often correlate with an AD-type pattern on functional FDG-PET imaging, although more occipital involvement and more sparing of the mesiotemporal area may be seen with PD. A recent study suggests that more extensive changes may actually be seen in PD patients with dementia;21 this study compared 18-FDG and 11-C PIB metabolic patterns along with structural changes on MRI in nondemented Parkinson’s (PD) and demented Parkinson’s (PDD) patients, with healthy patients serving as controls. Their data suggest that the development of dementia in PD may also be associated with frontal lobe atrophy on MRI, with extension of hypometabolism on FDG-PET beyond the occipital lobe into the frontal lobe, and even through more diffuse brain areas, such as the deep brain structures. The degree of glucose hypometabolism was associated with the degree of cognitive impairment. Beta amyloid deposition is not believed to be a hallmark of PD dementia; if seen postmortem, its presence is thought to reflect the coincidental development of Alzheimer’s disease. Pick’s disease accounts for the largest proportion (at least 70%) of patients with frontotemporal lobar degeneration; the disease is characterized by the presence of Pick bodies, protein tangles in neuronal tissues. Disease onset tends to occur at a younger age than that of AD,with the most common incidence occurring between ages 45 and 65; the disorder can also present before age 30, as well as in the elderly.The cause of Pick’s disease is unknown; some forms of inherited frontal lobe dementia can be indistinguishable, clinically and histologically, from Pick’s disease. Differentiating between FTD and AD is currently based on clinical data and examination, but the distinct metabolic patterns of both diseases as seen on PET can significantly improve diagnostic accuracy. A prospective FDG-PET study evaluated 22 patients with FTD who underwent both baseline and follow-up scans during an average duration of 19.5 months. PET demonstrated symmetrical hypometabolism of the frontal lobes with relative sparing of the motor cortex, caudate nuclei, insula, and thalami at baseline.23 At follow-up, further significant reductions in glucose metabolism were observed in the parietal and temporal cortices. The use of FDG-PET stereotactic surface projection (SSP) metabolic and statistical maps have been shown to improve sensitivity of PET in early diagnosis of FTD.20 Preliminary data from neurochemical studies of FTD patients, as well as functional PET imaging using serotonin receptors, have indicated abnormalities in serotonin metabolism, which has led to clinical trials of drugs with serotoninergic effects. In the past few years, much attention has focused on the development of radiotracers for PET imaging of more specific pathologic processes, including agents that detect the beta-amyloid deposits, the neurofibrillary tangles, and other processes in AD. The deposition of beta-amyloid (Aβ) is thought by many to be an early event in the pathogenesis of AD. Pittsburgh Compound B (C11PIB), a thioflavine analogue, was the first tracer used to selectively label Aβ in vivo. A relatively simple and practical way to quantify Aβ uptake in vivo in a clinical setting is by quantifying C11PIB binding. In AD, marked PIB retention occurs in areas of ß-amyloid deposition, such as in the temporoparietal cortex. Recent studies indicate a future potential use for C11PIB in predicting time of progression of MCI to AD.24 Cholinergic agents are also being developed for PET imaging and may provide additional evidence for the cholinergic hypothesis of AD, as well as provide insight into the functional mechanisms of novel drug therapies directed to the cholinergic system. The evaluation of dopamine receptor integrity with carbon-11 dihydrotetrabenazine (DTBZ) has also been extensively researched in patients with diffuse Lewy body disease and Parkinson’s disease. Early studies suggest that the distribution volume of DTBZ is significantly decreased in the caudate nuclei and putamen in DLB and PD patients compared to patients with AD.25 Several other agents are in the pipeline for targeted receptor imaging, several of which are mentioned in Table 4. The role of PET in the clinical workup and management of dementia is expected to increase in the near future, not only for preclinical and differential diagnoses but also for the evaluation of response to novel therapies that are currently in development. The widespread availability ofPET scanners, along with new and improved quantitative analysis methods, has improved scan quality and diagnostic information provided by these studies. Data suggest that including PET in the diagnostic algorithm of patients with dementia can result in more cost-effective and accurate diagnoses, particularly in differentiating DD from FTD. Kertesz A. Pick Complex: An integrative approach to frontotemporal dementia: Primary progressive aphasia, corticobasal degeneration, and progressive supranuclear palsy. Neurologist. 2003;9:311-317. Kertesz A, Hudson L, Mackenzie IR, Munoz DG. The pathology and nosology of primary progressive aphasia. Neurology. 1994;44:2065-2072. DSM-IV-TR: The Current Manual. http://www.psych.org/MainMenu/Research/DSMIV/DSMIVTR.aspx. Accessed January 13, 2011. Silverman DH. 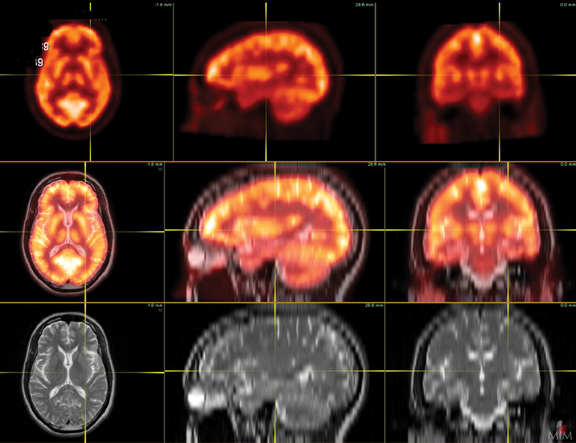 Brain 18F-FDG PET in the diagnosis of neurodegenerative dementias: Comparison with perfusion SPECT and with clinical evaluations lacking nuclear imaging. J Nucl Med. 2004;45:594-607. Zhu CW, Sano M. Economic considerations in the management of Alzheimer’s disease. Clin Interv Aging. 2006;1:143-154. General Information. http://www.nia.nih.gov/Alzheimers/AlzheimersInformation/GeneralInfo/. Accessed January 13, 2011. Schuff N, Zhu XP. Imaging of mild cognitive impairment and early dementia. Br J Radiol. 2007;80 Spec No 2:S109-14. Silverman DH, Cummings JL, Small GW, et al. Added clinical benefit of incorporating 2-deoxy-2-[18F]fluoro-D-glucose with positron emission tomography into the clinical evaluation of patients with cognitive impairment. Mol Imaging Biol. 2002;4:283-293. Hoffman JM, Welsh-Bohmer KA, Hanson M, et al. FDG PET imaging in patients with pathologically verified dementia. J Nucl Med. 2000;41: 1920-1928. Yamaguchi S, Meguro K, Itoh M, et al. Decreased cortical glucose metabolism correlates with hippocampal atrophy in Alzheimer’s disease as shown by MRI and PET. J Neurol Neurosurg Psychiatry. 1997;62:596-600. Mosconi L, Tsui WH, Herholz K, et al. Multicenter standardized 18F-FDG PET diagnosis of mild cognitive impairment, Alzheimer’s disease, and other dementias. J Nucl Med. 2008;49:390-398. Landau SM, Harvey D, Madison CM, et al. Comparing predictors of conversion and decline in mild cognitive impairment. Neurology. 2010;75:230-238. Patwardhan MB, McCrory DC, Matchar DB, et al. Alzheimer disease: Operating characteristics of PET--a meta-analysis. Radiology. 2004;231:73-80. Morinaga A, Ono K, Ikeda T, et al. A comparison of the diagnostic sensitivity of MRI, CBF-SPECT, FDG-PET and cerebrospinal fluid biomarkers for detecting Alzheimer’s disease in a memory clinic. Dement Geriatr Cogn Disord. 2010;30:285-292. Silverman DH, Gambhir SS, Huang HW, et al. Evaluating early dementia with and without assessment of regional cerebral metabolism by PET: A comparison of predicted costs and benefits. J Nucl Med. 2002;43:253-266. Centers for Medicare & Medicaid Services. http://www.cms.gov/mcd/viewncd.asp?ncd_id=220.6.13&ncd_version=2&basket=ncd:220.6.13:2:PET+(FDG)+for+Dementia+and+Neurodegenerative+Diseases. Accessed January 13, 2011. Silverman DH, Small GW, Chang CY, et al. Positron emission tomography in evaluation of dementia: Regional brain metabolism and long-term outcome. JAMA. 2001;286:2120-2127. Lim SM, Katsifis A, Villemagne VL, et al. The 18F-FDG PET cingulate island sign and comparison to 123I-beta-CIT SPECT for diagnosis of dementia with Lewy bodies. J Nucl Med. 2009;50:1638-1645. Minoshima S, Foster NL, Sima AA, et al. Alzheimer’s disease versus dementia with Lewy bodies: Cerebral metabolic distinction with autopsy confirmation. Ann Neurol. 2001;50:358-365. Jokinen P, Scheinin N, Aalto S, et al. [(11)C]PIB-, [(18)F]FDG-PET and MRI imaging in patients with Parkinson’s disease with and without dementia. Parkinsonism Relat Disord. 2010;16:666-670. Neary D, Snowden J, Mann D. Frontotemporal dementia. Lancet Neurol. 2005;4:771-780. Diehl-Schmid J, Grimmer T, Drzezga A, et al. Decline of cerebral glucose metabolism in frontotemporal dementia: A longitudinal 18F-FDG-PET-study. Neurobiol Aging. 2007;28: 42-50. Jack CR,Jr, Wiste HJ, Vemuri P, et al. 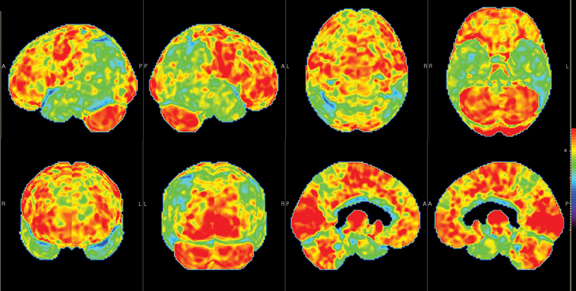 Brain beta-amyloid measures and magnetic resonance imaging atrophy both predict time-to-progression from mild cognitive impairment to Alzheimer’s disease. Brain. 2010;133:3336-3348. Koeppe RA, Gilman S, Junck L, et al. Differentiating Alzheimer’s disease from dementia with Lewy bodies and Parkinson’s disease with (+)-[11C] dihydrotetrabenazine positron emission tomography. Alzheimers Dement. 2008;4(1 Suppl 1):S67-76. The role of PET in dementia diagnosis and treatment. Appl Radiol.